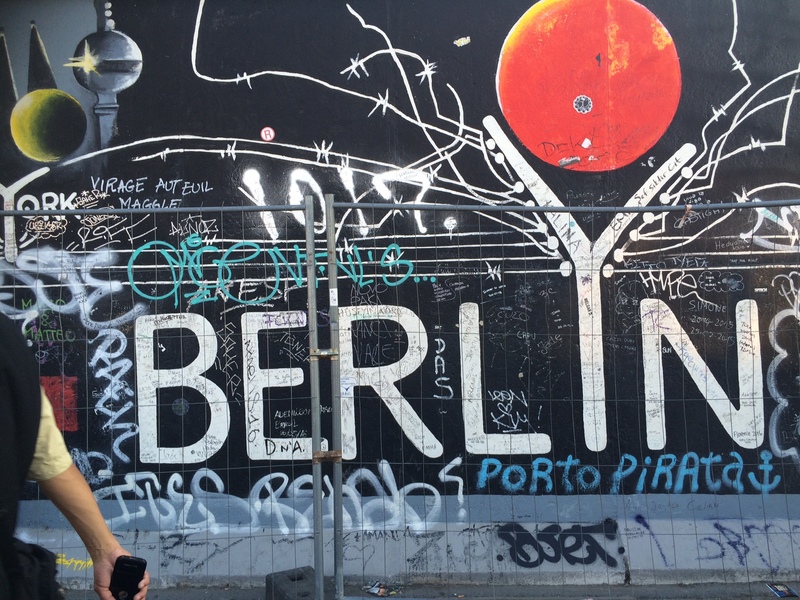 I have been spending a couple of days in Berlin doing the things tourists do — walking, eating, museums. Berlin is beautiful and clean and civilized. 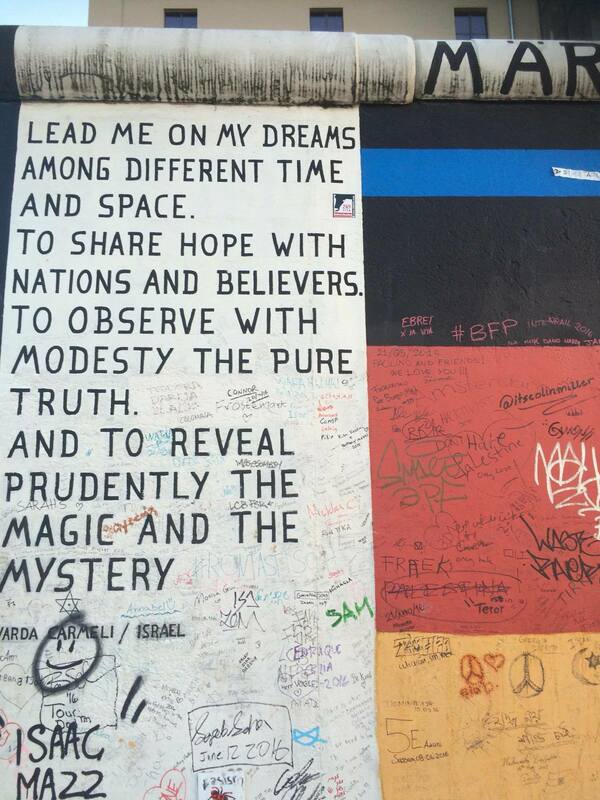 I have enjoyed all of it but what will always stay with me is the time I spent at the Berlin Wall. 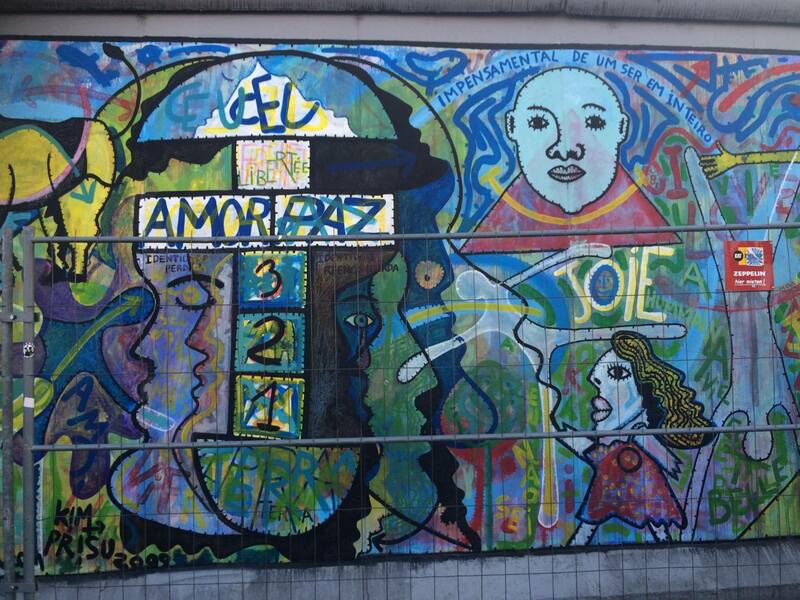 Once several miles long, the wall was built in 1961 to stop the migration of East Berliners to West Berlin. East Berlin was part of the Soviet Union and West Berlin was capitalist. In 1989, following protests and demonstrations, the Soviets opened the gates. 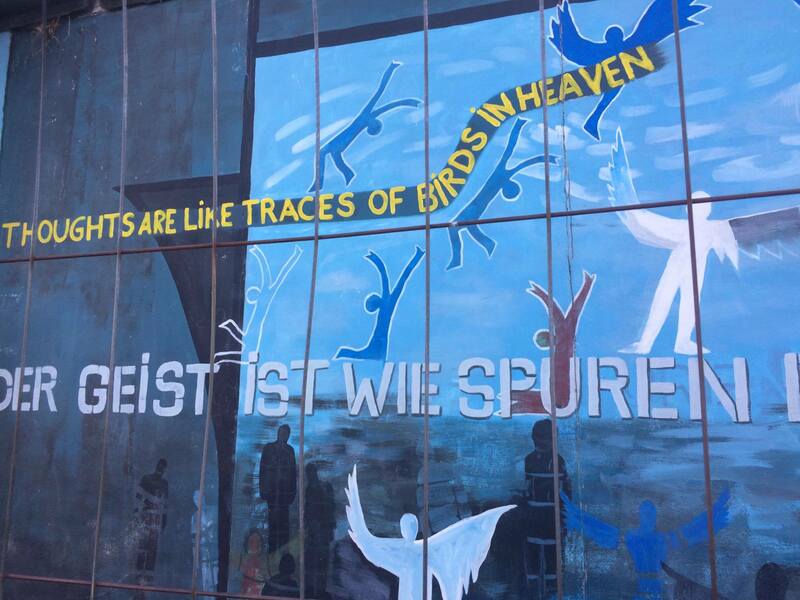 People from East Berlin poured into West Berlin joyful for their freedom and the opportunity to join the vibrant economy of the west after years of deprivation and austerity on the other side of the wall. 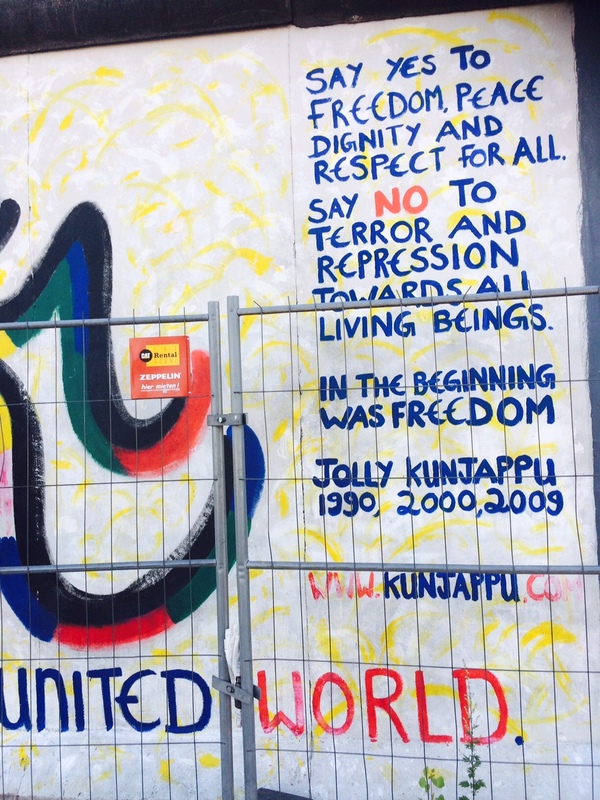 Today what remains of the Berlin Wall is covered in art and graffiti that celebrate freedom and hope for humanity. Walls and fences and borders are back in fashion. Among today’s wall builders are the US, Hungary, Macedonia, Israel, Spain, Austria and the United Kingdom. 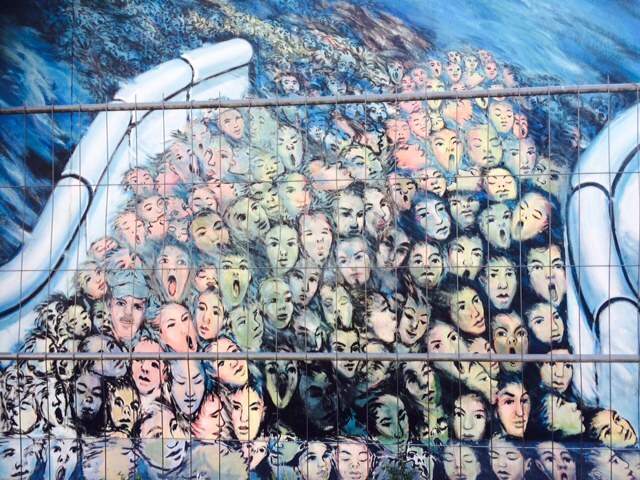 Like the Soviet Union in 1961, today’s wall builders are trying to control people who, like the people of East Berlin before 1989, want freedom. I wish the wall builders would come to Berlin. 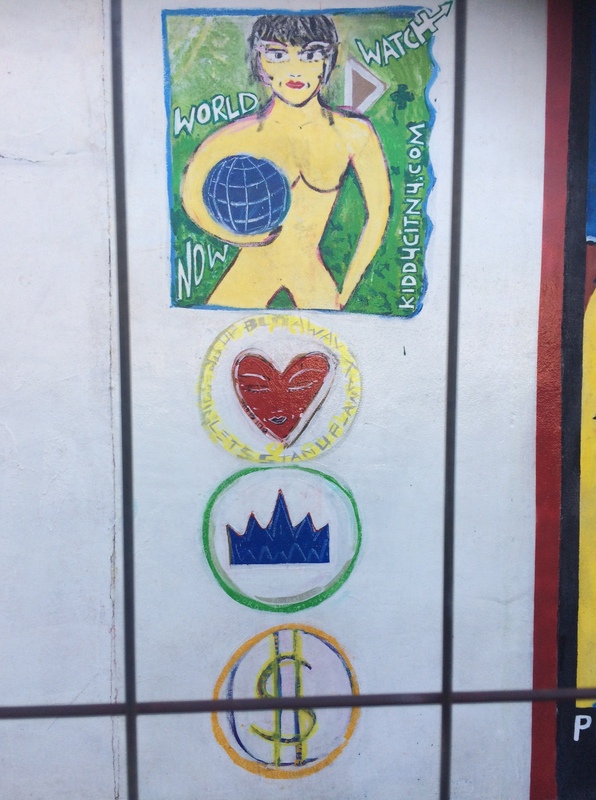 They would see how history views walls that keep people from escaping violence and repression and poverty. They would see how taking down the wall has created a vibrant, united community. 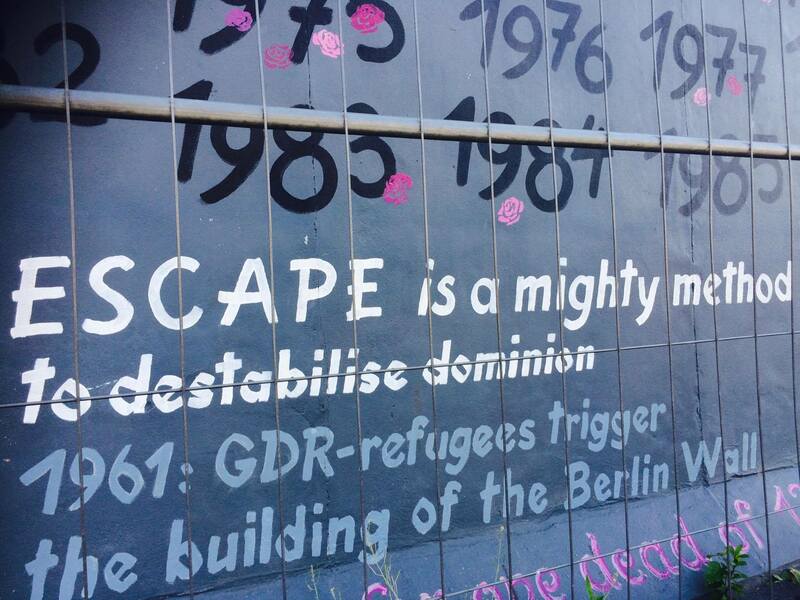 Who would rebuild the Berlin Wall? Beautifully expressed. 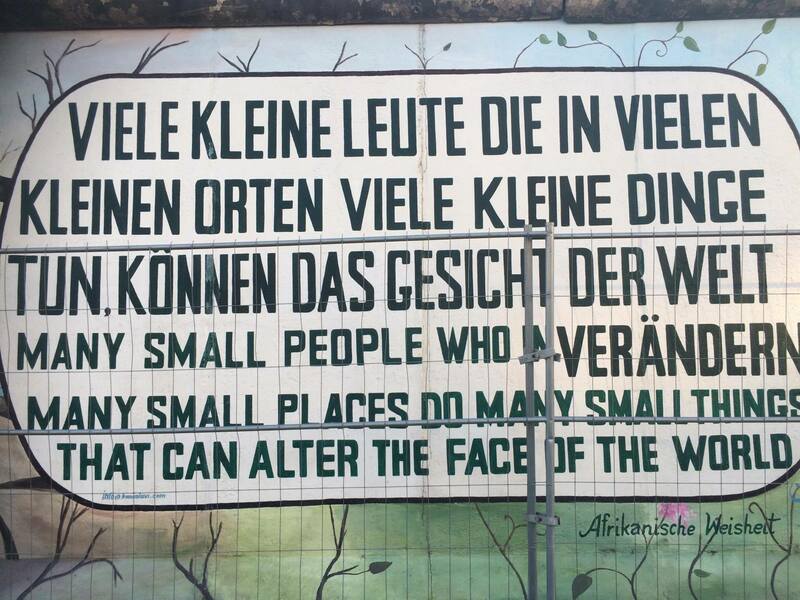 Perhaps some of the people of Germany should visit their own wall as a reminder. I want to go there. The last time I saw the Berlin Wall was through Check Point Charlie and it had a far different feel. 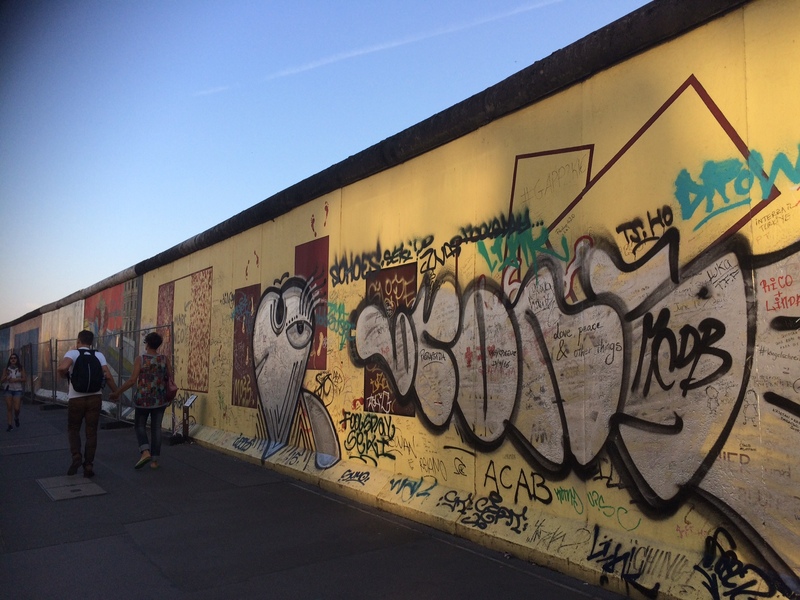 I had been to Berlin a fewf times while The Wall was up. The Wall, with its ominous guard towers and armed troops, had a dark and foreboding presence with an aura of death and despair. 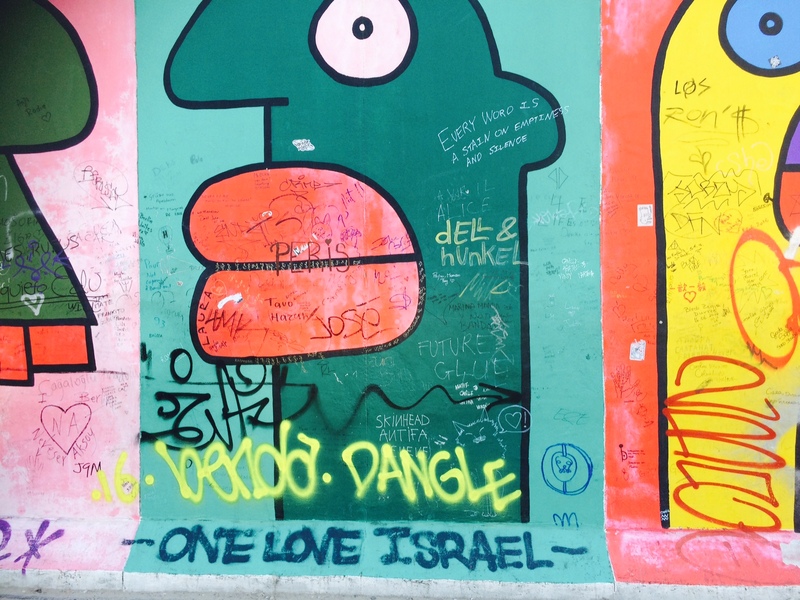 The graffiti which covered The Wall cried out against walls of all kinds which separate peoples. 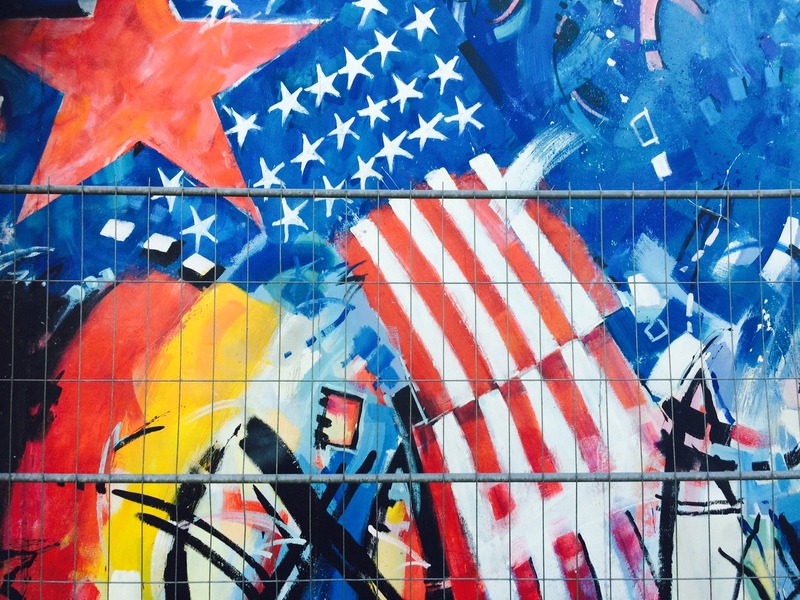 By good fortune, I happened to arrive in Berlin ten days after the wall came down. The Germans from both East and West were still joyously enjoying their newly gained freedom of movement and sense of unity. The lasting image I have is the dozens and dozens of pop-up tent “stores” which arose by the Brandenburg Gate and along remains of The Wall selling pieces of The Wall being chipped off by folks with sledgehammers as we watched. Almost overnight a new product line as popular as iPhones had been developed! There were thousands of Germans and tourists happily shopping among the tents as if they were at a giant outdoor mall. Admittedly, I was a bit shocked by the tents openly selling East German and Soviet military artifacts (including weapons!) by scavengers profiting from spoils gathered from thousands of deserters. It was capitalism at its very best and very worst. It was a large and raucous country fair with plenty of good will to go around. Sadly, that spirit soon was to disappear,… at least for a while. When I returned a six months later, there was graffiti all over town urging “East Germans Go Home!” as a hateful swirl of anti-East German sentiment arose among many West Germans who feared job losses to Eastern emigres, resented that their tax monies were being redirected to be spent on upgrading the stagnant and decrepit former East Germany, and reacting to the significant cultural distinctions between East and West which had developed during the long period of post-WWII ideologically and physically divided Germany. But as the years passed, these antagonisms seem to have faded and my sense gathered in several visits over the past couple of decades is that German is once again truly reunited, for better or worse. Nice background story Vic! East Berlin is now the happening place and it is beautiful. I am not sure about whether the cultural differences have melted away — one cab driver said they hadn’t for people who were adults before the wall came down. But the young people seem to be all just Berliners.